It shouldn’t be too surprising that Hong Kong’s young filmmakers of late keep focusing their attention on stories that deal with the city’s social problems. After all, if they want to receive government funding for their projects, they know they have to avoid tackling politically-charged topics that have already landed some of their industry colleagues in hot water with the authorities on both sides of the border. The latest entry in this feel-good genre is STILL HUMAN from first-time feature filmmaker Oliver Chan Siu Kuen/陳小娟. Fortunately, Chan tones down the usual schmaltz we often see in films like these and delivers a well-written story about two people who are invisible to mainstream society for different reasons but who are determined to change that. 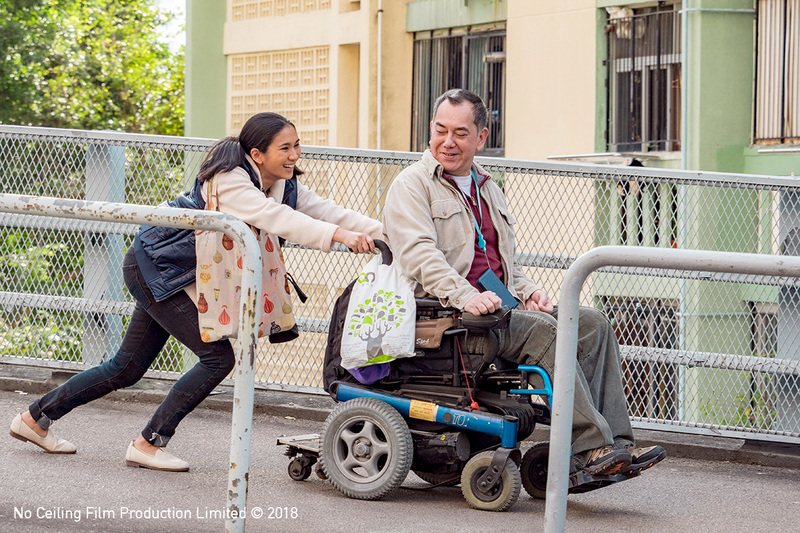 In the film, Leung Cheong-wing (Anthony Wong Chau-sang/黃秋生, THE SLEEP CURSE (失眠); TV’s WHITE DRAGON aka STRANGERS) is a middle-aged man who is paralyzed from the chest down due to an injury he received on a worksite years before. Abandoned by his wife and son who now live in the US, Leung would be totally alone if it weren’t for his best friend, Fai (Sam Lee), who has just found for Leung yet another new live-in caregiver to look after him. Evelyn Santos (Crisel Consunji), is fresh off the plane from the Philippines and, like all of her fellow domestic helpers in the city, she’s come for financial reasons. Highly educated, she can make more money here cooking and cleaning than she can by working in an office or hospital back home. Evelyn is really a babe in the woods though. She doesn’t speak Cantonese and Leung only speaks a couple words of English. And while she is sweet and naïve, he is gruff and cynical. Not surprisingly, their relationship gets off to a very rocky start but as the two learn to communicate with each other, they find that they have a lot in common. Both had their dreams taken away from them. Feeling empowered again thanks to Evelyn’s care and support, Leung decides to make sure that Evelyn’s dreams don’t disappear a second time. There are obvious and fair comparisons between STILL HUMAN and the 2011 French film, INTOUCHABLES (and its inferior American remake, THE UPSIDE), but STILL HUMAN still manages to charm due to Consunji’s performance. The actress’ own career path has a lot in common with that of her character. A master’s degree holder in Political Science from the Philippines, Consunji joined the cast of Hong Kong Disneyland in 2008 as a musical performer. These days, when she’s not working on her master’s degree in Education, she’s running a chain of early childhood development centres in Hong Kong, which she co-founded in 2015. The film has a few cringe-worthy moments, notably when Wong speaks stereotypical Hong Kong Chinglish, but they’re over early enough in the story as his character becomes more proficient in English. All in all though, STILL HUMAN is a nice story about a pair of strangers who find humanity in each other. Chan has already received the Best New Director award at the Asian Film Awards and there’s a good chance the film will be the big winner at this Sunday’s (April 14) Hong Kong Film Awards, where it is has been nominated for eight awards. If you’re looking for a simple and heartfelt film to watch this weekend, check STILL HUMAN out.